Looking for my other books? I’ve been living the past for a couple of days now, re-tracing routes that Ralph and I drove last summer. I’ve written about a couple that I want to include in a new version of Ride Minnesota (don’t get excited, it’s long ways off). I’m also trying to make something out of our tour around Lake Superior. It was a completely different trip and didn’t fall into the same pattern as Ride. While I’m studying road maps and Google satellite images and recalling what I saw, felt and experienced, I’m also trying to stake out my territory in motorcycle dealerships for the upcoming riding season. While I haven’t heard the rumble of a bike in my neighborhood yet, I have been visiting bike shops in the Twin Cities area. The Indian dealership on I-94 in St. Paul said I could bring in a few copies of the book to sell. They don’t want to run it through their inventory, but they’ll put it out on the counter and collect the money for me. Fair enough. Fury Motorcycle in South St. Paul invited me to its open house on April 26. Justin Olmeim tells me they had 2,000 bikers at their event last spring. It’s an offer I can’t refuse! Northway Sports in East Bethel, one of my first and best supporters, has an open house the same day. Somehow, I’ll have to find a way to attend both events. King Solomon, where are you? The generosity of the biking community in allowing me to hang out at their places of business, to carry my book and encouraging me to get out and push totally defies the tough-guy image that leather, studs and loud bikes proclaim. Waiting to board the ferry to Madeline Island. Cynthia Sowden is a freelance writer and editor. She puts her 30-plus years of corporate communications experience to work for businesses of all sizes. These are her thoughts on the business of writing. 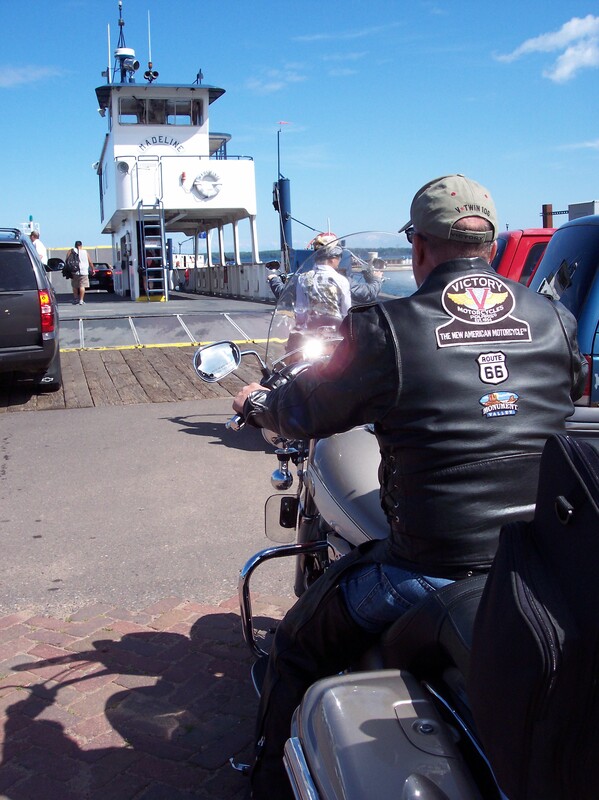 Posted on March 13, 2014, in Motorcycles, Ride Minnesota and tagged Google satellite, Indian Motorcycles, Lake Superior, Northway Sports, riding season. Bookmark the permalink. Leave a comment.